from a name you can trust, Landstroms. Your #1 source for Landstroms Black Hills Gold jewelry! Our online store will provide you with the best value on the best Black Hills Gold and Black Hills Silver jewelry available, made in America only steps from the Black Hills National Forest for over a century by the original, Landstroms. Since 1878, Landstroms has been making the best quality Black Hills Gold mens and ladies rings, traditional bracelets, classic earrings, time-honored necklaces and stunning watches. But Landstroms also makes a complete line of specialty jewelry as well, including Mothers jewelry, diamond jewelry, wedding rings and bands, and contemporary styles such as body jewelry and the more-affordable gold on silver jewelry. From quality heirloom jewelry to modern bling, you'll find exquisite Landstroms jewelry to meet your needs. You have a choice in online jewelry stores and it's important to shop with someone you trust. As Landstrom's #1 online outlet, we offer the Best Quality, Lowest Prices, unmatched Customer Service and FREE Shipping of your Black Hills Gold direct to your door*... plus Landstrom's Lifetime Warranty. We want to be your only source to buy Black Hills jewelry, so we will treat you like Gold! ORIGINAL BLACK HILLS GOLD JEWELRY! 1. Save Big - Guaranteed: Our factory-direct pricing will SAVE you up to 30% on the same Black Hills jewelry vs. buying from a retail shop. Why pay more when you can get the same jewelry, made by Landstroms and shipped direct to your door by Landstroms for a whole lot less? And every item on our website carries the same Landstroms Lifetime Warranty. ***And in the rare instance you find a lower price, let us know and WE WILL BEAT IT. 2. Large Selection with No Minimum Order: We have a large and growing selection of hot new ladies rings as well as time-tested favorites. You'll find Landstroms Black Hills Gold gifts for every occasion, from hip new body jewelry to classic mother’s jewelry, we can meet your needs. ***And our handy Menus and Search Box to help you quickly find what you're looking for. 3. Fast Shipping: All orders are shipped direct from Landstrom's factory within 10 business days, even if the item is out of stock and must be made for you. Orders for in-stock items ship within two business days. 4. Fast Customer Service Response: Our customer service team responds to over 90% of emails within 1 hour during normal business hrs. We're here to give you that extra touch in service. 5. Money Back Guarantee: Not happy with your purchase? No Problem. Our money back guarantee means you can buy and not worry. 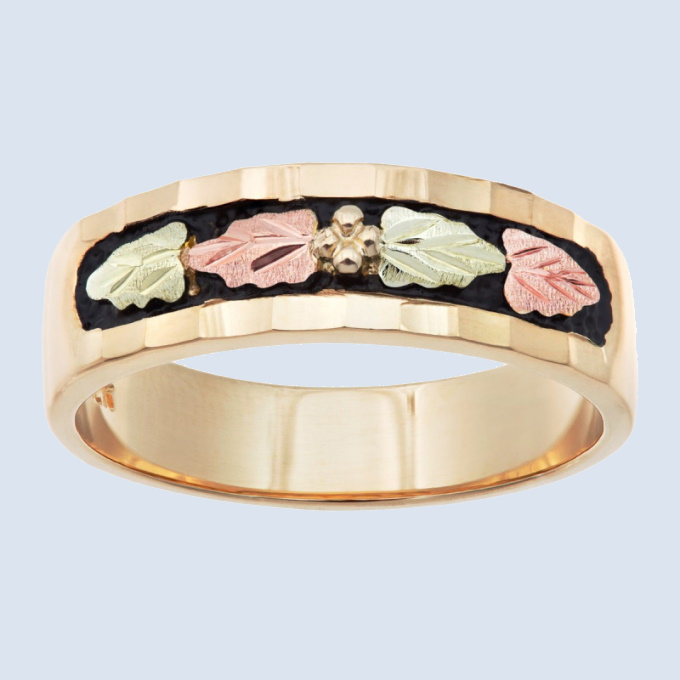 Buy your Black Hills Gold wedding sets here and save! 6. Safe And Secure: Our shopping cart is protected by industry standard SSL encryption technology. We will never sell any information collected from our customers. You can shop with full confidence that your personal and purchasing information will remain private and secure. 7. Don't be fooled by imitations: Unfortunately, some unscrupulous dealers will refurbish used or damaged jewelry and then sell it to you as new. Every order shipped by BlackHillsGoldSource.com is shipped directly from Landstroms factory so you can always be sure that your Black Hills Gold engagement ring is authentic, brand new and made just for you. Only buy from a name you can trust! Original Landstrom's is the ORIGINAL Black Hills Gold! After the 1874 discovery of gold in the region, the Black Hills Gold Rush was on to extract the dark mountains' bullion. Landstrom's origins can be traced back to 1878 when jeweler S.T. Butler opened the first Black Hills jewelry store with his son, George M. Butler in Deadwood, South Dakota. The older Butler was trained by Henri LeBeau, a French prospector credited with bringing the tri-color leaf design to The Hills in 1876. In 1919, the company was divided into two companies: the F.L. Thorpe Company and the Black Hills Jewelry Manufacturing Company. In 1944 Ivan Landstrom bought the Black Hills Jewelry Manufacturing Company and in 1995 Black Hills Gold history went full circle when Landstrom's acquired the F.L. Thorpe Company, making Landstrom's the sole owner of all the original Black Hills jewelry designs! Watch our video about the history of Black Hills Gold on YouTube! Quality Landstroms jewelry is the BEST! You can see and feel the quality from the thickness of the leaves and ring shanks to the weight of gold in each piece. Landstroms has been making Black Hills Gold Jewelry better than anyone since the beginning by adding that extra touch in quality. That's why people who know Black Hills Gold ask for Landstrom's by name! Handcrafted Original Landstroms Black Hills jewelry is a unique American art-form made the same way it was originally created over a century ago - by hand. No two pieces of Landstrom's jewelry are alike. Each piece reflects the great pride and craftsmanship of talented artisans whose skills were taught by our predecessors over 100 years ago. Landstrom's Black Hills Gold jewelry has been revered as the best Black Hills Gold brand and it's been sought after for over a century. Though there are other brands, they simply can't match Landstrom's value. Legend Treat yourself to a piece of American history that has been cherished for generations. Landstrom's builds memories... one heart at a time. Wear your own Black Hills Gold grape leaf and find out why Gypsies traveling through South Dakota in the 1950's started a legend which says, "To one who wears the Black Hills Gold, good luck and fortune will unfold." Be sure to tour Landstroms factory on your next Black Hills vacation!